So here is The Oxford Companion to the Photograph. A quick glance at the sidbar to the left (or at many of my previous posts) will indicate why I think the title is a confusion. This is a beautiful book and (at least on brief perusal, since I just bought it) many of the entries seem useful. We'll see. 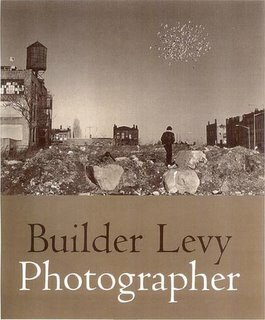 On February 9, 2006 (6 PM - 8 PM) the Tamiment Library is sponsoring a slideshow and book party for Builder Levy who will be discussing his recently published book "Builder Levy: Photographer." Levy's photographs eloquently depict "working people living real lives." Many were made in inner-city communities where Levy was a teacher of at-risk adolescents for 35 years. Others were taken in the hills, "hollers" and mines of the coal fields of Appalachia. Many depict civil rights and peace demonstrations; others are of ordinary people from the Russian steppes to Cuba. According to photographer Duane Michals Levy is in "the grand tradition of Lewis Hine and Dorothea Lange." Builder Levy's slide show and book talk will be held on Thursday, February 9, 2006 at SEIU Local 32 B.J's auditorium; 101 Avenue of the Americas, 22nd floor (between Grand and Watt Streets one block North of Canal Street). Use the Canal Street subway stop on the A, C, 1 or 9 trains. For more information please contact Michael.Nash@nyu.edu, 212-998-2428. I spent last weekend at a conference in NYC. The weather was wonderful - sunny and high 40s-low 50s. In January! Sunday I went to the ICP to see what is hanging. Here are very brief responses: The large space upstairs was devoted to "Che! Revolution and Commerce" which left me completely cold. Who cares? Revolutionary icon or advertising icon, neither enterprise was inspirational in the 60s or 70s, now both seem wholly irrelevant. An exercise in manufactured nostalgia. The small back room upstairs was given over to "African American Vernacular Photography: Selections from the Daniel Cowin Collection." This is a nice collection and some of the images were extremely revealing. However the exhibition was cramped and with just a few folks in the room, it was difficult to actually see the images, many of which are tiny. Downstairs was "The Body at Risk: Photography of Disorder, Illness, and Healing" some of which was very good. In particular I found the images from David Hanson's "Waste Land" project extremely powerful. This is a series triptyches comprised of Hanson's aerial photographs of toxic landscapes (taken in the mid-1980s) and flanked by USGS topographical maps and EPA text describing the sites. Overall though, the theme was way too diffuse to make much sense. The exhibition - including everything from Lewis Hine in the factories to Salgado on the end of Polio to stock FSA works to W. Eugene Smith to .... - really needed more thought to make it more than a vehicle for big names. As it stands the exhibition seems like a litany of the mostly bad things that happen to people. Finally, stuck back in the back corner is "Ken Light: Coal Hollow" which is focused and sobering. Light’s images of West Virginia landscapes and of the people who populate them are haunting. But the dedication to the coal miners who died on the job a couple of weeks ago already was inadequate given the news of yet more dead miners last Saturday. Joerg Colberg expresses concerning "The Disaster as Fine Art"
in his post (1/17/06) on his very good blog Conscientious. context in which to address it. Here is a photo-essay from The New Yorker.com on the politically induced disaster in New Orleans. I think the Republicans are mostly responsible. But, since the Democrats are simply unable to provide anything resembling effective political opposition, it is only fair to admit that this is a bi-partisan effort. 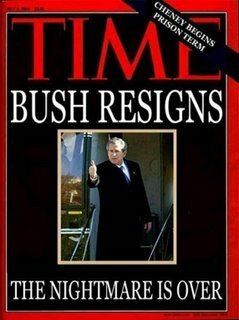 I am unsure which possibility is more unbelievable: (1) that Bush would, in fact, resign, or (2) that Time or any other major player in the mainstream media would actually acknowledge that he, his administration, and his policies are indeed a nightmare. So this would be a reminder to those who might want to follow Sontag and take a too narrow view of intention or to imagine that "use" is somehow governed entirely by convention. Dewey warns against the first tendency. And everything we know about the pragmatics of language suggests that conventions hardly determine use; any convention can be exploited in unforeseen ways. The late philosopher Donald Davidson went so far as to suggest that the ubiquitous opportunities for generating neologisms (unanticipated, unconventional usages) calls into question the very idea that language is conventional. And while sometimes such exploitation is accidental, sometimes it must be intentional and creative - hence the possibility of art. So, a topic for discussion: what is the "meaning" of the lynching photographs collected in Without Sanctuary? Those who initially took them - or who posed for them or who purchased them from those who initially took them - had some set of uses in mind. But what of James Allen, the man who has collected these images and created the exhibition? What sort of communication is involved in those very different instances?